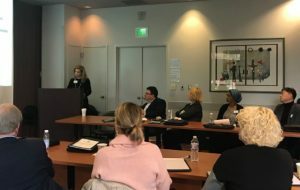 Recently, patient safety collaborators from across the globe traveled to The Johns Hopkins Hospital in Baltimore to take part in the inaugural Armstrong Institute for Patient Safety and Quality Observership. Participants arrived ready to take a deep dive with the Armstrong Institute into Johns Hopkins Medicine’s prioritized approach to patient safety. This pioneering three-day observership program gives health care leaders a window into Johns Hopkins Medicine’s programs for delivering consistently safe, high-quality and high-value care. Interactive and engaging sessions included presentations, facility tours and small-group meetings with Johns Hopkins Medicine leaders and subject matter experts. During group sessions and Q&A portions, participants were able to address their organizations’ individual challenges as well as global difficulties they’ve faced. The program will develop through participant feedback and the evolving needs of hospital safety departments. Participants gain insights for driving health care improvement efforts in their own organization’s culture. At the close of the observership, Munira Mwidau, B.S.N., R.N., from the Clinical Documentation Excellence Department at Johns Hopkins Health System, said she found the program very engaging. "The way the content was presented shows great thought went into the material to inform and included the senior members in the organization to front-line employees with insightful examples and explanations," said Mwidau. Robert Elliott, Armstrong Institute administrator explained, "The goal of the observership program is for participants to be able to return to their organization with a deeper understanding of the structures, strategies and resources needed to take patient safety and quality to the next level of care." The Armstrong Institute for Patient Safety and Quality Observership will be held twice yearly, in the spring and fall. Learn more about the program and register for an upcoming session. Fall 2019 Cohort: Nov. 11–13, 2019.